Some 15 years ago this week, England won the Rugby World Cup for the first time, beating Australia 20-17 after extra time, following Jonny Wilkinson’s drop goal with just 26 seconds left on the clock. The two nations square off again in what will be the final match of the Autumn Internationals for Eddie Jones’ men, although it would be a brave England vs Australia prediction to put any faith in another 80-minute draw. It’s 20/1 for anyone wanting to back this outcome, with the hosts the favourites to secure success at Twickenham at 4/11. Based on the sides’ recent head-to-head record, this is entirely fair. England are on a five-match winning streak since the start of 2016. What’s more, they’ve won four of their last five against Australia at Twickenham, which includes routine 37-21 and 30-6 triumphs in the last 12 months. The Wallabies warmed up for this Twickenham tussle with a 26-7 success in Italy and are wagering at odds of 11/5 to beat England. 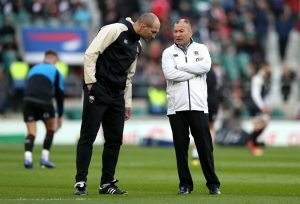 England’s head coach Eddie Jones (right) and coach Steve Borthwick (left) mull over tactics in the build-up to Saturday’s game. It’s now less than a year until the start of the 2019 Rugby World Cup in Japan and there appears a logical formula for Jones to follow. The first part would be to use the Autumn Internationals to build the foundations of his probable World Cup squad and then target the Six Nations early next year to master his preferred starting XV. Results and performances have been mixed during the opening three Autumn Internationals thus far: stealing a fortunate win against South Africa, being incredibly unlucky against New Zealand and then being second best for an hour against the future World Cup hosts. Little has been accomplished in nailing down starting and squad roles in numerous positions, with a worry still existing over the two centres on the basis that Owen Farrell has been consistently deployed at fly-half. 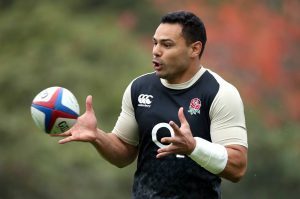 Ben Te’o gets the nod in Farrell’s other possible position at 12 against Australia, with Henry Slade selected alongside him at 13. The naming of Manu Tuilagi among the ‘finishers’ following his injury exodus potentially addresses part of this issue in the mid-term, although Jonathan Joseph and a positional switch for Elliot Daly are not out of the question in the future either. A strong performance from either of the starting duo should put them in pole position to start in the Six Nations and even potentially the World Cup. England’s Six Nations odds are currently trading at 5/2 behind 5/6 tournament favourites Ireland and 7/1 third favourites to repeat their World Cup success from 2003. Why not check out England’s outright odds? A common theme across all four of Australia’s games since the start of October is that the second half has been more eventful than the first. Michael Cheika’s charges have kept things especially tight in their latest two outings in Europe. Only six first-half points were scored in Wales and then 14 when facing Italy. It’s 4/5 that the second period is the highest scoring half when Australia face England. However, an even better England vs Australia prediction is that the hosts will be ahead at the break. In their last eight internationals, the Wallabies have only led at halftime in one. England are 4/7 to go into the interval ahead.